When global leaders converge on Paris Nov. 30 for the 2015 United Nations climate change conference, they should create guidelines and incentives for developing nations to cooperate with one another on lower-carbon energy projects, according to a report led by Princeton University researchers. Chinese firms in particular have recently accelerated the growth of coal power in developing nations, particularly in Asia, the researchers found. They conducted the first tally of power plants around the world involving Chinese companies. The graph above shows power plant capacity built with China-based firms (bottom axis), measured in gigawatts (GW), per global region (left axis). The colored bars correspond with a particular energy source with black representing coal. 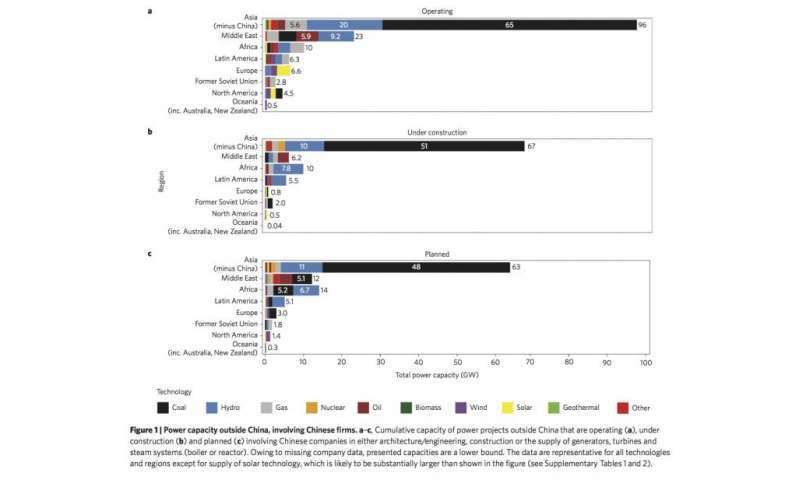 The researchers found that among the power capacities in Asian countries other than China that involve Chinese firms, 68 percent in operation (a), 77 percent under construction (b), and 76 percent in planning (c) burn coal. Credit: Image courtesy of Nature Climate Change; Hannam et al. When global leaders converge on Paris on Nov. 30 for the 2015 United Nations climate change conference, their goal will be to deliver an agreement that, for the first time, seeks to safeguard the Earth's climate by having all nations that are significant sources of carbon dioxide rein in their emissions. A threat to that plan might be the unchecked growth of coal-intensive energy in the world's developing nations—a dangerous trend recently accelerated by the expansion of Chinese firms seeking business internationally, according to researchers from Princeton University, Tongji University in Shanghai and the University of California-Irvine. The Paris conference is the 21st annual meeting to revisit and strengthen the international environmental treaty known as the UN Framework Convention on Climate Change (UNFCCC). Created at the 1992 UN Conference on Environment and Development, commonly known as the "Earth Summit," the treaty sets goals and procedures for signatory nations to contain and reduce carbon emissions. However, the researchers write in the journal Nature Climate Change that any agreement reached in Paris also should be expanded to provide guidelines and incentives—already under discussion for industrialized countries—for developing nations to cooperate with one another on lower-carbon energy projects. Failure to do this, the authors write, could allow further "dirty" energy cooperation between developing nations and complicate the United Nations' goal to keep the global average temperature within 2 degrees Celsius of what it was around 1750 at the dawn of the Industrial Age. "After years of effort to construct a truly global climate agreement, negotiators are on course to accept a system with incoherent rules for developed and developing countries in terms of investing in low-carbon energy outside their borders. We think that may be harmful in the long run," said lead author Phil Hannam, a doctoral candidate in the Program in Science, Technology and Environmental Policy (STEP) at Princeton's Woodrow Wilson School of Public and International Affairs. Carbon emissions continue to rise from energy production as developing nations such as India, Brazil and South Africa fuel their rapid industrialization, the researchers report. At the same time, developing nations such as China have the capital and technology to support other burgeoning economies. But the lack of international attention—and UN incentives—for developing nations to support each other's energy needs in a low-carbon way has helped keep coal power a popular choice, according to the authors. Chinese firms—which often have financial or policy backing from China's state banks—have poured coal-power equipment into other Asian countries, partly as a result of China's slowing domestic power-market growth. The situation could get worse as China pledges to reduce domestic carbon emissions, according to the paper. The researchers found that of the total power capacities in Asian countries other than China that have involvement from Chinese firms, 68 percent in operation, 77 percent under construction and 76 percent in planning burn coal. This level of involvement in coal exceeds the global trend, Hannam said. "While China has tightened its belt on coal power domestically, that's pushing Chinese firms to help build coal plants in other countries, so much so that China's firms are disproportionately focused in coal-intensive energy abroad relative to other nations," Hannam said. "Instead, if the UNFCCC integrated low-carbon cooperation between developing countries in the climate agreement, China could lead the way for countries to make pledges for low-carbon investment globally, just as they pledge domestic emissions cuts." "Climate finance," which Hannam and his co-authors focus on, is an important tool for guiding clean-energy development internationally. In an effort to keep global emissions low, a nation's government—usually in concert with private money—will support low-carbon development in other nations. Richer industrialized nations with a long history of emissions have committed to mobilizing climate finance to the tune of US$100 billion per year by 2020. Some of this funding will flow through the Green Climate Fund established in 2010 to support low-carbon investment in the developing world. Developing nations—generally with China at the helm—have entered into numerous parallel arrangements to support energy-sector growth in other developing nations. China has established the South-South Cooperation Fund for supporting low-carbon investment. Several other energy-financing agreements, however, are not only outside the UN's purview, they often benefit from vastly more funding than the Green Climate Fund or the South-South fund and have no explicit low-carbon directive, the authors reported. The New Development Bank headquartered in Shanghai and formed by China, Brazil, Russia, India and South Africa to support infrastructure projects in developing countries boasts a starting capital of $100 billion. Some $50 billion in capital is already behind the China-based Asian Infrastructure Investment Bank, and another $40 billion supports China's Silk Road Fund—both entities are intended to accelerate development in China's less prosperous neighbors. "This highlights the need for both developed and developing countries to agree to common definitions of what qualifies as climate finance," Hannam said. "Then the UNFCCC can look across the multiple emerging institutions and provide incentives for all power-sector finance—regardless of country of origin—to shift from coal to lower-carbon sources." The issues the authors discuss have already been broached in diplomatic circles, said Oppenheimer, who will be attending the Paris conference in part to promote the ideas laid out in the perspective piece. The United States recently persuaded China to reconsider its carbon-intensive power investments abroad, he said. While American support is crucial, climate finance is a complicated international balancing act that is influenced by many nations' pursuit of economic gain and influence, Oppenheimer said. "If the United States stays focused and makes this a priority within its international climate approach, then there's a fair chance other governments will likewise support such an effort," Oppenheimer said. "However, there is clearly more to international energy finance than just the United States and China. Japan, for instance, also finances coal power internationally and has a lot at stake politically in China's Asia-focused institutions. It's not simple." "Providing some systematic measurement of climate finance is extremely valuable, especially with regard to climate finance from China and other developing countries. As China's recent announcement to provide climate finance outside of the Green Climate Fund indicates, developing country finance will be an important part of the climate finance architecture," he said. "The massive external coal investment highlighted in [this paper] makes clear that South-South investment is not necessarily green investment," he said. "It also makes clear that incentives built into the Paris agreement—or post-Paris negotiations—to green South-South investment will be extremely valuable to support global efforts to decarbonize." The US is the biggest polluter, reneged on Kyoto, and is controlled by a handful of crime families. Somehow China is the problem though. We need a world-wide action against coal. Those who make their money in it will not stop just because it can kill us. We need all the large emitters to commit to deep cuts. But a lot of the smaller economies who are nonetheless top emitters (like Australia) use China as an excuse not to. China coming onboard with strong cuts pulls the rug out of that bit of sophistry. Eventually I think all of the rightwing nay sayers (the sane one I mean) will come to the conclusion of the necessity to abandon all fossil fuel use. That will include nations like China, Vietnam etc. AGW hurts them as much as it does the west. AGW is global after all and does require a government level response to make people conform to laws that will assist mankind's survival. The Chinese change over won't be easy, but I'm sure the people will be willing as we are in the USA. There was a time when all scientists believed in continental drift. One scientist disagreed and ended up proving the continental drift theory wrong and ushered in the present day theory of plate tectonics. The threat posed from man made Global warming will eventually be proven wrong. The consensus of science doesn't mean a theory is correct. evidence plate tectonics became accepted by most geologists but not all. John McPee's Pulitzer Prize winning Annals of a Former World tells the story in a "can't put it down" fashion without dumbing down the science. Some of it is dated, particularly the formation of the Rocky mountains but it is a fascinating must read. Support for AGW by the scientific community developed over time as more evidence was gathered just as happened with plate tectonics.